Not our doorstep, but love that kitty. A quote I’ve posted ad nauseam. It’s not easy, focused sweeping. Constant practice is necessary (for me). There is no one I can hire to sweep for me. And I am so happy when I sweep and Super Girl my doorstep(s) into sparkling—I feel smart and powerful. But then gunk returns, some days absolutely by the minute, or a doorstep pops up from 1996, one I thought I’d scrubbed into a Rothko sort of easy modern—but there I am, cleaning it again, maybe with a sander and some heavy duty eco paint (light blue). Before our literal doorstep, chimes sing and the hanging fern twirls in breezes (or harsh, desert-propelled winds) without falling off its hook and there’s a bench with a cheerful red cushion to sit on when removing your gardening or riding boots. My doorstep. My responsibility. Well, it’s scuffed and could use a sanding and a painting (white), but it’s clean and doesn’t smell like cat pee and it’s perfectly fine for a little boy to cross as he comes and goes with his Hot Wheels cars and Hero Factory figures. I removed the pair of black widows that used to live by our doorstep. I powerwashed cobwebs from the generic lintel. As I stand before our doorstep, arm muscles flexing from holding bags filled with weekly groceries, I feel a little rush of accomplishment and—ease. Food is going in the fridge. Bills are paid. The little boy is at a school where he thrives. I have time to focus on my art, that whatchamacallit only I can achieve, despite (or because of) any doorsteps I may have neglected or swept to within an inch of their architecture over the years. 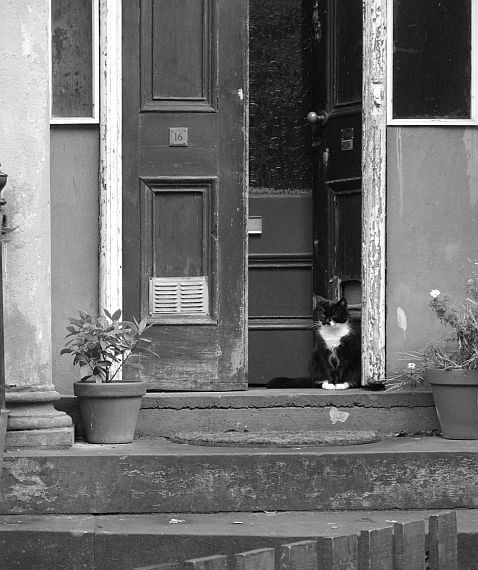 The current doorstep has much promise (perhaps a fancy lintel one day) and it’s quiet here—no radio, no TV news, no distractions except for the occasional gakking pet. Hi Ho! Bye-bye doorsteps of 1996, dearth doorstep of 2004, etc. This entry was posted in books, dog, Fiction, Poetry, Writer's Angst, Writing and tagged 2013, cats, doorsteps and lintels, fiction writing, Mother Teresa, poetry, preschoolers, Rothko, writing. Bookmark the permalink. Well, I hadn’t heard that quote before, and I’ve never given so much thought to my doorstep. It’s kinda icky right now. Diseased. Too much baggage. Occasionally smells like cat pee (there is seriously a posse of black cats living under the house next door). It’s time to do something about that doorstep! After my nap…. Oh, Beth—no doorstep (whether yours or a nice Fijian vacation doorstep) takes precedence over the nap. Hope you had a nice one!